Music. Fame. Drugs. Nonstop concerts and shows around the world. But what if one day you wake up and realize that the last forty years of your life were about nothing and all that it has left you is incredibly tired? Danny Collins is a musican, composer and entertainer who finds that he has wasted his entire life, when his long time friend shows him a letter written for him by John Lennon. John advises him in the letter: “No matter how famous you are: always stay true to yourself.” This line makes Collins reconsider his life and get back to his past, to reunite with the person he left behind – his son. Danny Collins begins with young Danny, in a scene where only his back is visible. We find him carefully listening to his manager about how he promises him a good future with lots of girls and music, and fame, like John Lennon used to have. But when the camera turns and focuses on the face of young Collins, you will probably be confused and surprised like the entire auditorium when you see Al Pacino the way he used to look in The Godfather or Scarface. This scene is only the beginning of a wonderful journey full of laughter, joy, and a bit of sadness; about the determination of a man, who in his 70’s, still does not want to give up on life. There is something special about Danny Collins – its endless charisma and simplicity, which makes this film absolutely unforgettable. Dan Fogelman, who advances from a writer (Crazy Stupid Love) to film director, makes an impressive directorial debut. His Danny Collins is a charming, educational, and absolute delight, to watch. This is a truly captivating film with a magic power that absorbs the entire audience into the story and does not release them until the ending titles. This is evident by the very satisfied viewer, who will get their portion of laughter, happiness, a lesson on the moral of life, and also, a stellar cast. Talking about cast. There is: Al Pacino, Annette Benning, Christopher Plummer, Jennifer Garner and Bobby Cannavale, who seems to have been born to play with Al Pacino. Al Pacino`s Danny is a very energetic, but aging rock star, who wakes up from a long sleep and realizes that it`s time to change his life. Collins, as many people do, makes mistakes. But Pacino`s character is one of those who learns from them and tries not to repeat them, even though, for him, it seems impossible. When he meets Mary Sinclair (Annette Bening), he gets a second chance, not only to rebuild his life, but to earn a chance to experience true love. Bobby Cannavale, who plays Al Pacino`s son, and, who I must say, has a specific connection with Al Pacino, looks to be his equal when they share the same scene. 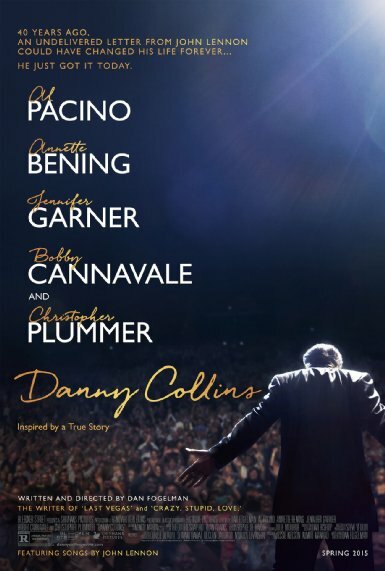 In conclusion, Danny Collins is not about music, fame or drugs or about what makes celebrities drown themselves in these things, but rather, it`s about a letter that eventually finds its destination, even after forty years. It is also about not losing yourself under any circumstances, and always to be true to yourself. And, when an opportunity comes, do not hesitate to go back in time to find the person whom you have abandoned; to take the opportunity to make their life more comfortable than ever. More importantly, what makes Danny Collins a must-see film, is that it once again reminds us that there is nothing more important than family, and the ability to not give up.